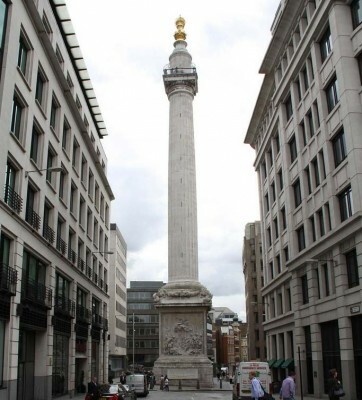 In England, the Monument to the Great Fire of London it is known simply as “The Monument”. It is located near the north end of the London Bridge, at the corner of Fish Street Hill and Monument Street. The site where it stands commemorates where St. Margaret’s Fish Street Church once stood until being the first place of worship destroyed by the flames. The origination point of this disaster was a shop that contained the kings baker, Thomas Farynor on Pudding Lane. There is another monument named “Golden Boy of Pye” standing near Smithfield where the blaze was eventually extinguished. The Monument to the Great Fire of London is made of stone and appears as a column in the Roman Doric style. An interesting feature of its design and location is the fact that its height is 202 feet and the distance between it and the spot where the Great Fire is believed to have been started is also 202 feet. The original design also served a scientific purpose. Its core was to be used as a zenith telescope and other experiments involving gravity, barometric pressure and pendulum effects were conducted here. There is an underground lab, still present, that can be toured today. The Great Fire occurred on September 2, 1666. Building of the monument began in 1671 and finished in 1677. The monument itself consists of a flute like shaped Doric column with a gilded gold urn of fire at its peak. It is the highest single stone column in the world. The designers were Robert Hooke and Sir Christopher Wren. Mr. Hooke was not only an architect, but a philosopher and was recognized as a Renaissance Man. Sir Wren is regarded as one of the most famous and accomplished architects in England’s history. Not only did he participate in the concept of the Monument to the Great Fire of London, but was responsible for the rebuilding of over 50 churches that were destroyed during the fire. One of these churches, St. Paul’s Cathedral is now recognized as a worldwide architectural masterpiece. At the entrance of the Monument to the Great Fire of London you will find three separate inscriptions, all in Latin. Wording on the north side tells the tale of how the fire started, the damage that it caused and how it was ultimately extinguished. The south side information is that of how Charles II dealt with its aftermath. To the east is a history of the monument itself. To the west you will be able to view a sculpture created by Caius Gabriel Cibber depicting the devastation caused by the fire. This statue also shows Charles II and his brother, the Duke of York supervising its restoration with the words science, architecture and liberty also displayed. To reach the top of the monument you must ascend 311 steps which are part of a narrow winding staircase. Nearing the apex of the tower you may notice a net-like enclosure preventing a clear view from that angle. This addition was made necessary during the mid 1800’s as a security measure after six people had taken their own lives leaping from the tower during the preceding half century. As part of a refurbishment to the monument that was performed between 2007 and 2009, a panoramic camera was added to the top of the structure to provide a 360 degree view of London. It is used today to monitor building and ground activity as well as the weather. It is in operation 24 hours a day and updated every 60 seconds.